This chart is intended to be a guide. CREON capsules represent nearest capsule count within recommended dosing range. Patients weighing <110 lb may require a lower lipase unit starting dose. Patients weighing >315 lb may require a higher lipase unit starting dose. Meals and snacks are for illustrative purposes only. 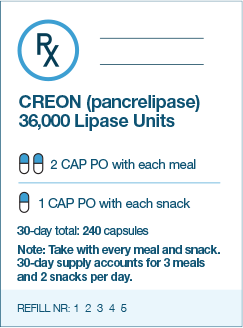 CREON® (pancrelipase) Delayed-Release Capsules is a pancrelipase which is a combination of porcine-derived lipases, proteases, and amylases indicated for the treatment of exocrine pancreatic insufficiency due to cystic fibrosis, chronic pancreatitis, pancreatectomy, or other conditions. per meal (or greater than 10,000 lipase units/kg of body weight per day). To avoid irritation of oral mucosa, care should be taken to ensure that CREON is not crushed, chewed, or retained in the mouth. CREON should always be taken with food. Porcine-derived pancreatic enzyme products contain purines. Caution should be exercised when prescribing CREON to patients with gout, renal impairment, or hyperuricemia. There is theoretical risk of viral transmission with all pancreatic enzyme products including CREON. Adverse reactions that occurred in at least 2 cystic fibrosis patients (greater than or equal to 4%) receiving CREON were vomiting, dizziness, and cough. Adverse reactions that occurred in at least 1 chronic pancreatitis or pancreatectomy patient (greater than or equal to 4%) receiving CREON were hyperglycemia, hypoglycemia, abdominal pain, abnormal feces, flatulence, frequent bowel movements, and nasopharyngitis. CREON is not interchangeable with any other pancrelipase product.